To compensate for my inability to sound like a real Australian, I collect Aussie slang, rather in the style of a magpie picking up shiny bits and decorating her nest with them. Or maybe like a packrat, ditto. Aussie slang is redolent with the most wonderful images, many of them socially dodgy, if not downright profane, but all either funny or excruciatingly apt, or both. And many of the best ones, I’ve learned, have their origins in Australia’s agricultural heritage. For instance, describing someone hard at work and focused on the job: “Head down, bum up.” Shearer. I’ve been collecting and using Aussie slang since I first got here in 1996, and now I can’t always remember whether an expression is American or Australian. Take “offsider”. Here, it refers to a friend who is also someone you work with. I had this vague idea it might have come from US sports, where “off sides” is some infraction of rules in American football (?). Not so. After this past weekend, I’m nearly sure it’s a purely Australian expression originating with bullock (oxen) teams. Bullocks pulling wagons are yoked two together, and they need to pull in coordination with each other, with neither one slacking or turning, or otherwise making life difficult for the other. As with horses, there is a “near side” (the animal’s left side, the side you get on a horse) and an “offside”—the other side. In a bullock team, the lead bullock is on the left side of the first pair, and the second-in-command is on his off side—his “offsider”. So "offsiders" in Australia describes a wonderful group of people: the individuals you can count on to hold up their end of the plank, to support you without trying to supplant you, who pull their own weight gracefully, without fuss, and who you don’t mind being in harness with when there’s a tough job to be done. I’m lucky enough both to have offsiders in my life, and to be an offsider myself. 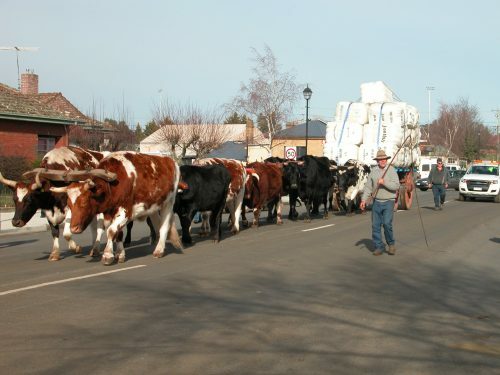 In the latter capacity, this past weekend I helped put on a rare show for the town of Oatlands (and for rather a lot of visitors from around the state and the mainland): a team of 12 bullocks pulling a loaded 1850s vintage wool wagon through the streets of Oatlands. It was an absolute blast. Bullock drivers (bullockies) figure heavily in Australian lore and stories of bullock teams hauling great loads of wool, logs, supplies and grain from the interior to the coast are branded on the national psyche. Sadly, much of the expertise in handling bullock teams is disappearing, so it’s rare to get a chance to see a team doing real work. The response was wonderful. 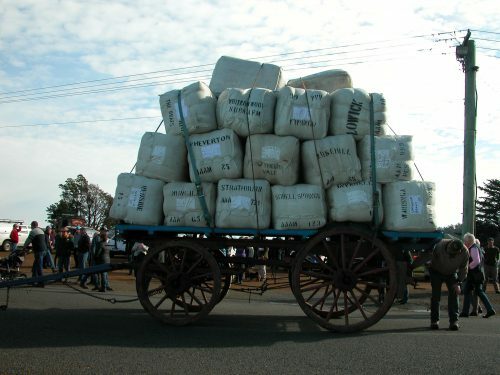 Local woolgrowers paid $100 for the privilege of having their branded bales on the wagon and getting a family history photograph of it being transported by bullocks. The general public paid $5 each to get in to see a wonderful collection of restored wagons, carts, jinkers and even an old stagecoach. There was a traditional Aussie country barbeque: hamburger on a slice of bread or sausage ditto, with or without grilled onions, $2, soft drinks, tea and coffee $2, and an auction of old horse- and bullock-drawn carts and harness. All up, we netted about $9000 which will go to support our local hospital. It was a weekend filled with people enjoying themselves, immersed in the cultural heritage of country Australia. We had two of the most spectacular days of winter weather I have ever seen in Oatlands: sunshine, no wind, and a balmy 10 C (50F). Not quite the image of heat conjured by Henry Lawson’s poem “The Teams” (1900), but pretty nice for August in Oatlands! With eyes half-shut to the blinding dust, And necks to the yokes bent low, The beasts are pulling as bullocks must; And the shining tires might almost rust While the spokes are turning slow. A most unusual photo of Oatland’s Lake Dulverton: full of water, and without a breath of wind on Sunday mid-morning.